The finalists of the Northern Alberta Institute of Technology (NAIT) Student Social Housing Design Competition were recognized at the Friday luncheon. 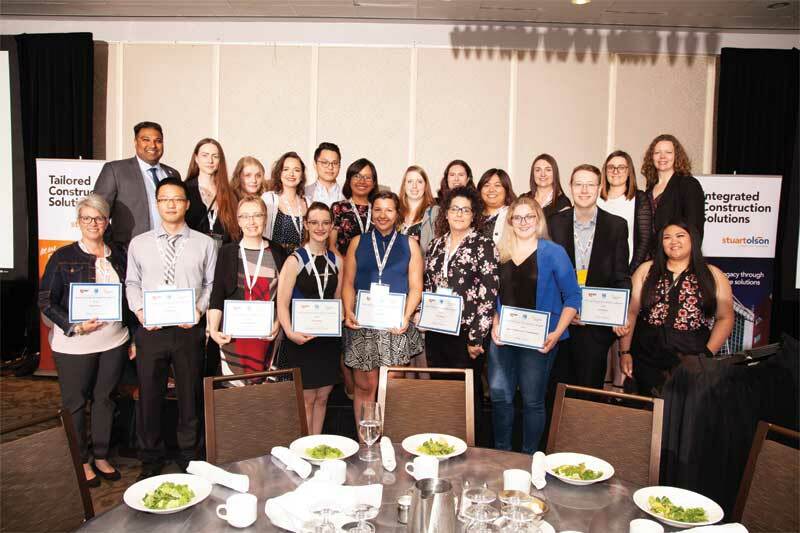 At the next day’s luncheon (sponsored by TimberStone Distribution), the CSC Edmonton Chapter, along with the Capital Regional Housing Corp. and the Northern Alberta Institute of Technology (NAIT), hosted the finalists of the NAIT Student Social Housing Design Competition. Team 6 took first place. Congratulations to Hafsa Salman, Celine Doutre, Katherine Campbell, Katelynn McKenna, Sarah Price, and Colin Schulte. During the CGC-sponsored Fun Night, attendees got a chance to trace their Polish roots with an evening of entertainment and magic at the famed Polish Hall. Keeping with the theme of collaboration, attendees divided up into teams and put their design skills to the test by competing in a Lego building competition. “Team Pink” took top honours with its “flamingo and babies” entry. A highlight of the conference is always the President’s Reception (sponsored by BSD) and Ball (sponsored by Custom Tile Installation System). CSC President David Boyle had the privilege of introducing this year’s Life Award and President’s Award recipients to the delegates, companions, and special guests. The President’s Award recipients were Brian Colgan, Peter Emmett, Kazim Kanani, Cathy Schneider, and Nick Franjic. 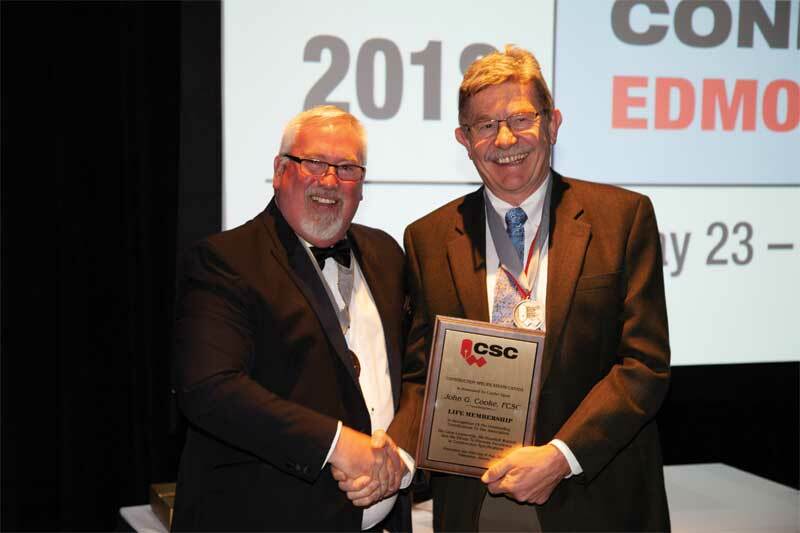 The CSC Life Award is the highest accolade the association bestows on individuals in recognition of their service. This year, two distinguished CSC members were honoured with Life Awards: John Cooke, FCSC, RSW, of the Ottawa Chapter and Peter Semchuk, FCSC, RSW, CCCA, CET, of the Edmonton Chapter. CSC president David Boyle, CTR, presents John G. Cooke, FCSC, RSW, with a CSC Life Award. Cooke has been a member of CSC for nearly 25 years, having joined in November 1993. As partner and president of John G. Cooke and Associates, he is also the senior structural engineer in the firm. His responsibilities include technical review, specification writing, and client liaison. His particular fields of expertise are heritage and masonry conservation and project management. When Cooke joined CSC, he immediately realized he could use the organization to improve aspects of the construction industry. In the mid-1990s, he co-authored CSC’s engineering co-ordination document. As an employer, he is a strong supporter of CSC’s educational programs. After becoming a registered specification writer (RSW) himself in 2002, he realized sending his staff members to take—as a minimum—CSC’s Principles of Construction Documentation (PCD) course not only helped things run better in his office, but also meant he was able to provide better and more cost-efficient contract documentation to his clients. Since joining CSC, he has held various positions in the Ottawa Chapter executive. He joined as vice-president in 2002 and served as president from 2006 to 2007. He continues to be active on the executive today. a Conference Program Director’s Award.